ROD (meaning kin, origin, family in Bulgarian) was created in the mid-1990s to preserve the authentic folk heritage of the Bulgarian people. Listings are by cassette number within series. ROD Magic Water 1  Authentic folk songs of Dryanovo, rod/rodopa mountain. 1992 (= Subdibula/Impressario). ROD Magic Water 2  Folk songs of Gorny Lozen, Sofia district. 1992 (= Subdibula/Impressario). ROD Magic Water 3  Gagauz Folk songs of Oreshak, Varna district. 1992 (= Subdibula). ROD Magic Water 4  Folk songs of Borovo, rod/rodopa mountain. 1993. ROD Magic Water 5  Folk songs of Borovo, rod/rodopa mountain. 1993. ROD Magic Water 6  Instrumental pieces played on bagpipe. 1993. ROD Magic Water 8  Folk songs of Alino, Samokov region. 1993. ROD Magic Water 9  Authentic Folk songs of Marten, Rousse district. 1993. ROD Magic Water 10  Authentic Folk songs of Marten, Rousse district. 1993. ROD Magic Water 11  Authentic Instrumental pieces played on kaval and gûdulka of Marten, Ruse district 1993. ROD Magic Water 14  Authentic Folk songs of Vratsa, Kyustendil district. 1995. ROD Magic Water 15  Authentic Folk songs of Vratsa, Kyustendil district. 1995. ROD Magic Water 16  Authentic Folk instrumental pieces played on tambura of Central Western Bulgaria. 1995. ROD Magic Water 17  Authentic Folk songs of Tetovo, Russe district. 1995. ROD Magic Water 18  Authentic Folk songs of Tetovo, Russe district. 1995. ROD Magic Water 19  Authentic Folk songs of Yuper, Tetovo and Marten, Russe district. 1995. ROD Magic Water 20  Authentic Folk songs of Yuper, Russe district. 1995. ROD Magic Water 21  Authentic Folk songs of Popina, Silistra district. 1995. ROD Magic Water 22  Authentic Folk songs of Popina, Silistra district. 1995. ROD Magic Water 23  Authenitc Folk instrumental pieces played on gadulka of Popina, Silistra district. 1995. ROD Magic Water 24  Authenitc Folk songs of Garvan, Silistra district. 1995. ROD Magic Water 25  Authenitc Folk instrumental pieces of Garvan, Silistra district. 1995. 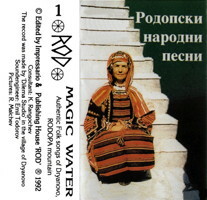 ROD Magic Water 26  Authentic Folk spring and summer songs of Bulgaria.1995. ROD Magic Water 27  Authentic folk songs of Nedelino, rod/rodopa mountain. 1995. ROD Magic Water 28  Authentic folk songs of Nedelino, rod/rodopa mountain. 1995. ROD Magic Water 29  Authentic folk songs of Nedelino, rod/rodopa mountain. 1995. ROD Magic Water 30  Authentic folk instrumental pieces played on kaba gayda of Nedelino, rod/rodopa mountain. 1995. ROD Magic Water 31  Authentic Folk instrumental pieces played on gayda in Mihailovo, Bankya region. 1996. ROD Magic Water 32  Authentic Folk instrumental pieces played on gayda of Mihailovo, Bankya region and Pelatikovo, Kyustendil district. 1995. ROD Magic Water 33  Authentic Folk songs of Basarbovo, Ruse district. 1996. ROD Magic Water 34  Authentic Folk songs of Basarbovo, Rouse district. 1996. ROD Magic Water 35  Authentic Folk songs of Sredna kula, Russe district. ROD Magic Water 36  Authentic Folk songs of Sredna kula, Russe district. ROD Magic Water 37  Authentic Folk songs of Tsenovo, Russe district. ROD Magic Water 38  Authentic Folk nuptial songs and instrumental pieces of North-Eastern Bulgaria. ROD Magic Water 39  Authentic Folk songs and instrumental pieces played on kaba gayda of Luki, rod/rodopa mountain. ROD Magic Water 40  Authentic Folk songs of Belitsa, rod/rodopa mountain. ROD Magic Water 41  Authentic Folk songs of Belitsa, rod/rodopa mountain. ROD Magic Water 42  Authentic Folk songs of Belitsa, rod/rodopa mountain. ROD Magic Water 43  Authentic Folk songs of Zdravets, rod/rodopa mountain. ROD Magic Water 44  Authentic Folk songs of Borovo, rod/rodopa mountain. ROD Magic Water 45  Authentic Folk songs of Luki, rod/rodopa mountain. ROD Magic Water 46  Authentic Folk songs and instrumental pieces of Shiroki dol, Samakov region. ROD Magic Water 47  Authentic Folk songs and instrumental pieces of Shiroki dol, Samakov region. ROD Magic Water 48  Authentic Folk songs and instrumental pieces of Shiroki dol, Samakov region. ROD Magic Water 49  Authentic Folk instrumental pieces of Shiroki dol and Zlokuchene, Samakov region. ROD Magic Water 50  Authentic Folk instrumental pieces played on bagpipe of Zlokuchene, Samakov region and Cherven, Ruse district. ROD Magic Water 51  Authenitc Folk instrumental pieces played on dvoyanka, kaval and duduk of Shiroki dol, Samokov region. ROD Magic Water 52  Authentic Folk songs and instrumental pieces from the town of Slivnitsa, Sofia district. ROD Magic Water 53  Authentic Folk songs and instrumental pieces from the town of Slivnitsa and the region of Burel, Sofia district. ROD Magic Water 54  Authentic Folk songs and instrumental pieces from the town of Slivnitsa and the region of Burel, Sofia district. ROD Magic Water 55  Authentic Folk songs of Beli Iskur, Samokov region. ROD Magic Water 56  Authentic Folk songs and instrumental pieces played on gûdulka of Yudelnik, Russe district. ROD Magic Water 58  Authentic Folk songs of Yudelnik and instrumental pieces played on gûdulka of Yudelnik and Yuper, Russe district. ROD Magic Water 59  Authentic Folk instrumental pieces played on gûdolka of Dobromirka, Sevlievo region. ROD Magic Water 60  Authentic Folk instrumental pieces played on gûdolka of Dobromirka, Sevlievo region. ROD Magic Water 61  Authentic Folk songs and instrumental pieces played on kaval of Raduil, Samokov region. ROD Magic Water 62  Authentic Folk songs and instrumental pieces played on kaval of Raduil, Samokov region. ROD Magic Water 63  Authenitc Folk instrumental pieces played on kaba gayda of Luki, rod/rodopa mountain. ROD Magic Water 64  Authenitc Folk instrumental pieces played on kaba gayda of Luki, rod/rodopa mountain. ROD Magic Water 65  Authentic Folk instrumental pieces played on kaval and glashnitsa of Dzhurkovo, Rhodopa mountain. ROD Magic Water 66  Authentic Folk instrumental pieces played on kaba gayda and kaval of Dzhurkovo, Rhodopa mountain. ROD Magic Water 67  Authentic Folk songs and instrumental pieces played on kaba gayda of Dzhurkovo, Rhodopa mountain. ROD Magic Water 68  Authentic Folk songs and instrumental pieces played on kaba gayda of Dzhurkovo, Rhodopa mountain. 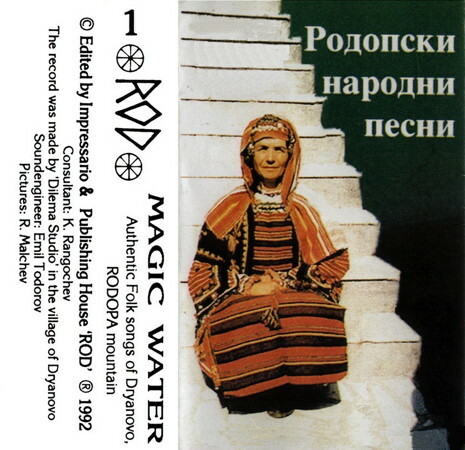 ROD Magic Water 69  Authentic Folk songs of Yugovo and instrumental pieces played on kaval of Dzhurkovo, Rhodopa. ROD The City 1  Folk instrumental pieces played on gayda, kaval, and gûdulka from Sofia. ROD The City 2  Folk instrumental pieces played on gayda, kaval, gûdulka, tsafara, and okarina from Sofia.